For the 2011 model year, Jeep ushers in its fourth-generation Grand Cherokee; one of the last products conceived during Chrysler's now defunct partnership with Daimler. The latest Grand Cherokee rides on an all-new platform that shares certain key components with the next-generation Mercedes-Benz ML, lengthening its wheelbase by more than five inches, but only slightly expanding overall exterior dimensions. As a result, the vehicle remains a dedicated five-seater unlike many of its competitors, which have added third row seating in recent years. Regardless of its modest commonality with the ML-Class, the Grand Cherokee feels like a distinctly Jeep product, offering improved levels of refinement and sophistication while retaining the key Grand Cherokee attributes of formidable off-road capabilities, rugged style and on-road competence. If you want a traditional SUV that offers good outward visibility, a roomy and functional interior, and solid off-road chops, you'll like the Jeep Grand Cherokee. That said, buyers who never make use of its robust character will still find the Grand Cherokee impressively comfortable on road. You may not like the Jeep Grand Cherokee if you need to carry more than five occupants – unlike many of its competitors, the Jeep doesn't offer a third-row option. Also, if you have no intentions of taking your vehicle off the road well traveled, you might prefer the enhanced comfort and fuel economy offered by the latest breed of on-road focused crossover utility vehicles. Big changes for 2011 on the Jeep Grand Cherokee include improved interior space, an all-new V6 engine, an updated V8 engine and enhanced four-wheel drive systems. Jeep has also added a host of optional features not previously seen on the Grand Cherokee, including adaptive cruise control, a power rear lift gate and a blind-spot warning system. When driven off of paved roads, the 2011 Jeep Grand Cherokee impresses with its sure-footedness and abundance of traction. In addition to a trio of four-wheel drive systems, each offering an increasing level of capability and sophistication, the Jeep's relatively compact dimensions allows it to squeeze through narrow passages that would stop other larger off-roaders. It is worth noting that the fourth-generation Grand Cherokee features an independent rear suspension instead of a live axle, resulting in more moments with a rear wheel in the air while off-roading; a less than ideal situation when rock crawling. With all that said, most drivers will never venture off road, and during normal driving on paved roads, the Grand Cherokee impresses with a comfortable ride, surprising levels of grip when cornering, decent steering feel and a quiet interior, even at freeway speeds. Our only real complaints are an excess of body lean during abrupt maneuvers and substantial dive under hard braking. The optional Quadra-Lift air suspension is an excellent supplement to the Grand Cherokee's four-wheel drive systems. When raised to maximum height, the system creates 10.7 inches of ground clearance and improves approach and departure angles along with break-over height. The system can also lower the vehicle, easing entry and egress as well as improving aerodynamics at higher speeds, enhancing fuel economy. Similar to a system already offered by Land Rover, Selec-Terrain lets the driver quickly adjust vehicle behavior for a variety of driving environments. With a twist of a single knob, the system tweaks torque distribution, as well as transmission and throttle behavior along with the stability control and the air suspension – if equipped – to maximize performance on snow, rocks, mud, sand or tarmac. The cabin of the Grand Cherokee has always offered a premium experience, especially compared to other more stripped-down Jeep products, but the latest version takes that notion to a new level. Expanded use of soft materials, real wood trim and tasteful but attractive interior themes add an upscale persona to the otherwise simple and functional cabin. Passenger space is good in all seating positions, with rear seat passengers enjoying an extra four inches of leg room compared to the previous model. Cargo volume has also expanded, with 35.1 cubic feet behind the rear seats and nearly twice that amount available with the 60/40 split rear seats folded. There's no mistaking the 2011 model as anything other than a Grand Cherokee, yet the newest iteration represents a far more sophisticated and modern interpretation of the vehicle's now familiar shape. Standard Jeep cues including a seven-slot grille, hexagonal wheel arches and minimal front and rear overhangs are enhanced with taut new body panels, creating a masculine chiseled look. In back, for the first time on a Grand Cherokee, buyers can select a power rear lift gate. Another new exterior add-on is a panoramic sunroof that bathes the interior with natural light but creates quite a bit of wind noise when open. 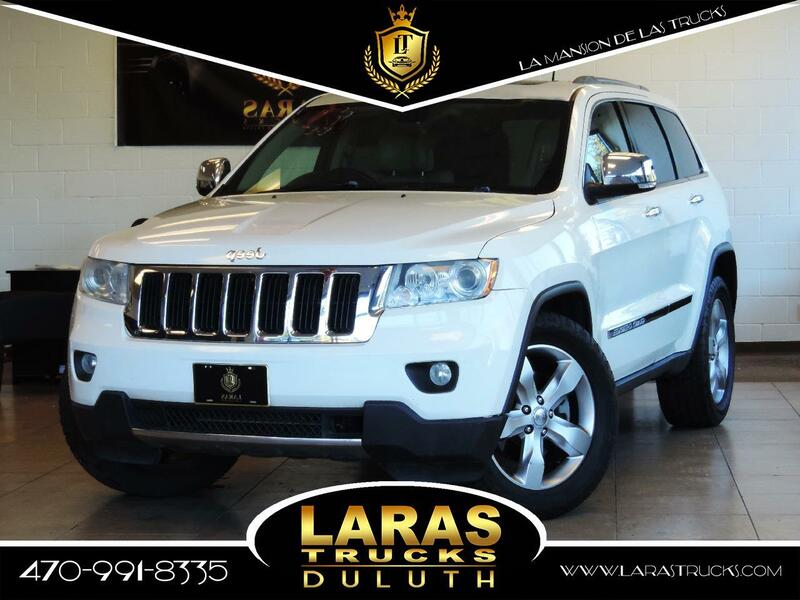 In its most basic form, the 2011 Jeep Grand Cherokee features cloth seats, rear-wheel drive, an eight-way power driver's seat, automatic headlights, SIRIUS Satellite Radio, and a six-speaker audio system with auxiliary input. Standard safety features include stability control, traction control, electronic roll mitigation, trailer sway control, six-airbags and active head restraints. The base Jeep Grand Cherokee can be up-fitted with a wide variety of features in including leather seats, a power passenger seat, ventilated front seats, heat front and rear seats, a heated steering wheel and HID headlights. In terms of in-vehicle entertainment and communications, buyers can add a premium nine-speaker audio system, USB audio port, rear-seat DVD entertainment system, navigation and the UConnect hands-free communications system. Among the more high-tech options now available are rear parking sensors with a backup camera, adaptive cruise control, blind-spot alert and rear cross-traffic detection. Engine choices include a 3.6-liter V6 and a 5.7-liter V8 engine, each equipped with a five-speed automatic transmission. V6 buyers enjoy decent acceleration along with a 5,000-pound tow rating, while those who opt for the V8 benefit from an increased tow rating of 7,400 pounds along with more spirited performance. Rear-wheel drive is standard, but the Grand Cherokee can be equipped with three different four-wheel drive systems, ranging from the simple full-time Quadra-Trac I system to the highly capable Quadra-Drive II system featuring a two-speed transfer case and an electronic limited slip rear differential. In its least expensive form, a rear-drive Jeep Grand Cherokee Laredo trim checks in at a Manufacturer's Suggested Retail Price (MSRP) around $31,000. Move up to a fully-loaded four-wheel drive Overland trim, and the price jumps to nearly $47,000. Compared to competitors including theFord Explorer and Honda Pilot, prices for the Jeep Grand Cherokee tend to be somewhat higher. Before buying, be sure to check KBB Fair Purchase Price to see what the Jeep Grand Cherokee is selling for in your area. Although the 2011 Grand Cherokee is expected to hold higher resale value than the previous generation, it is still expected to hold its value more poorly over time than either the Pilot or Explorer.